This presentation was kicked off by an incredible demonstration of Virtual Reality being used to create a work of art live on stage. After the dramatic opening, Pat Gelsinger CEO of VMware took to the stage to present. 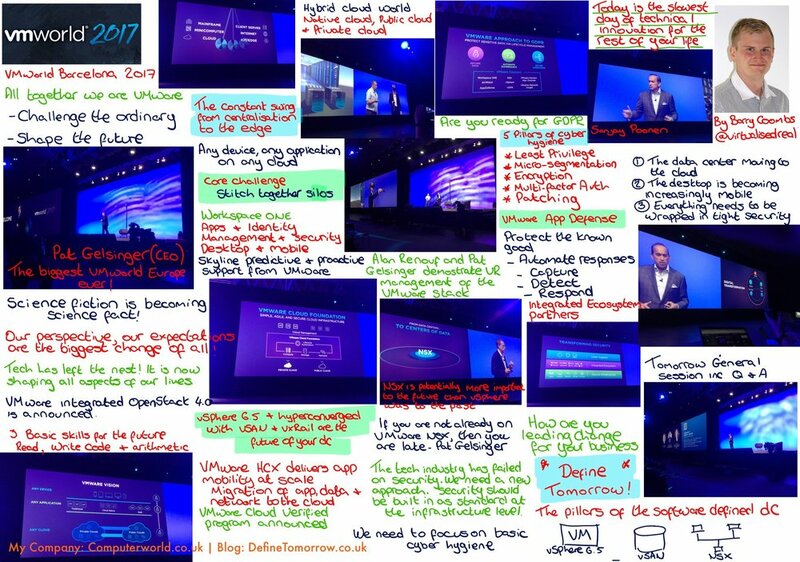 The presentation was all focused around the VMware vision and which technologies are helping VMware achieve their vision of any application, any cloud and on any device. Pat discussed how vSphere 6.5 is always central to their business and vision, however new technologies such as NSX and AppDefense are now at the core of everything VMware is doing and security is now the 'secret sauce' for VMware. Pat discussed the need to stop 'fighting bad now and actually start ensuring good', and with technologies such as AppDefense can easily help businesses do this. We also joined the EUC showcase session hosted by Sumit Dhawan and Shawn Bass who discussed the VMware solutions around EUC in particular Workspace ONE. They were joined on stage by colleagues to demo the seamless technology to demonstrate the ease of use for end users but also keeping the data secure from a management perspective. Myself and Barry also attended the VMUG Leader Lunch where we were joined by Joe Baguley and Pat Gelsinger to discuss how the VMWare vision and messaging can be used and communicated throughout the local VMUG meetings across the globe. We also had the opportunity to discuss with other VMUG leaders how they ensure their meetings are successful and what we can all do to grow the expert community. If you would like to join our Bristol VMUG, or your local VMUG, click here for more information. I also was incredibly lucky to have the opportunity the record a video with Joe Baguley, VMware CTO where we discussed the diversity around gender within the tech industry and how that impacts a female within the industry. To hear what we got up to yesterday and our thoughts around the partner exchange at VMworld, click here.